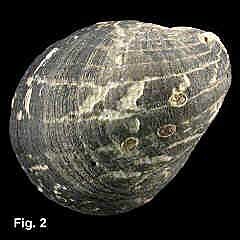 Description: Shell with spire depressed, width greater than height. Sculptured with broad, low, spiral ribs. Columellar deck pustulose, particularly at outer edge; columella concave centrally, smooth or with two or three weak teeth centrally. Outer lip with one or two strong teeth posteriorly, sometimes one anteriorly, and 12-15 weak lirae. Exterior dull, black with white flecks or patches, often formed into two irregular spiral bands. Columella deck white or yellow, aperture white. 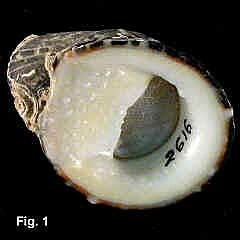 Operculum calcareous, finely pustulose, grey or yellowish. Size: Up to 24 mm in height, commonly about 16 mm. Distribution: Indo-West Pacific; in Australia, as far south as Sydney, NSW. Habitat: Shelters under rocks on open coasts between mid and low tide. Abundant in the tropics, uncommon in NSW.